Alienware Alpha Review - The Alienware Gaming Console? 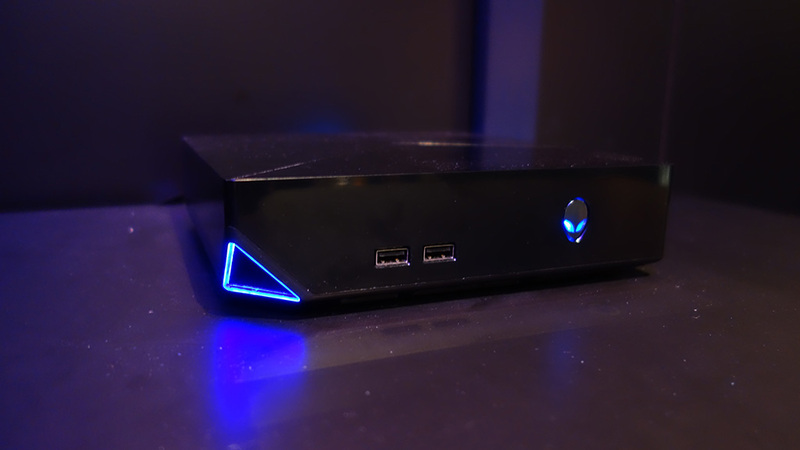 Alienware Alpha Review – The Alienware Gaming Console? The Alienware Alpha gaming console is actually the company’s latest desktop. It was first announced as a Steam Box, but it ended up being a gaming machine built around the user and controller friendly XBMC. It’s a pint-sized desktop PC that is designed to reside in your living room. It has the same performance capabilities as the Xbox One, and it’s smaller than Sony’s PlayStation 4. Your gaming machine comes with an included wireless Xbox 360 controller – free of cost! It’s a pretty great value package, but I do recommend going for the more reliable and faster Alienware Alpha model – I’m talking about the one that houses a quad-core Core i5 with 8GB of RAM. It’s smaller and lighter than any other gaming console on the market i.e. PlayStation 4 and Xbox One. It even matches their performance. The package includes a Xbox 360 wireless controller at no additional cost, and it has a dedicated Alienware UI that’s intuitive and easy to use. However, it’s way more expensive than Sony’s or Microsoft’s console and its entry level model drastically limits its performance by housing an inferior CPU and a small amount of RAM. Xbox One on the left and Alienware Alpha on the right. It clearly looks better than the PS4 and the Xbox One. It has glossy plastic coated sides, with the front of the machine displaying an Alienware glowing power button and two USB 2.0 ports. The top of the console sports a beautifully designed matte finish, which is divided by a trifecta of centred lines. One of its corners is cut away so it can showcase more LEDs – a nice design touch, if I may add. Not only does the Alienware Alpha console rival the PS4 and Xbox One on performance, but design-wise, in this humble reviewer’s opinion, it takes the cake. It measures 200 millimetres wides, with 200mm deep and just about 56mm tall. This means that it’s only 3mm longer than the PS4, but 105mm narrower and 75mm not as deep. 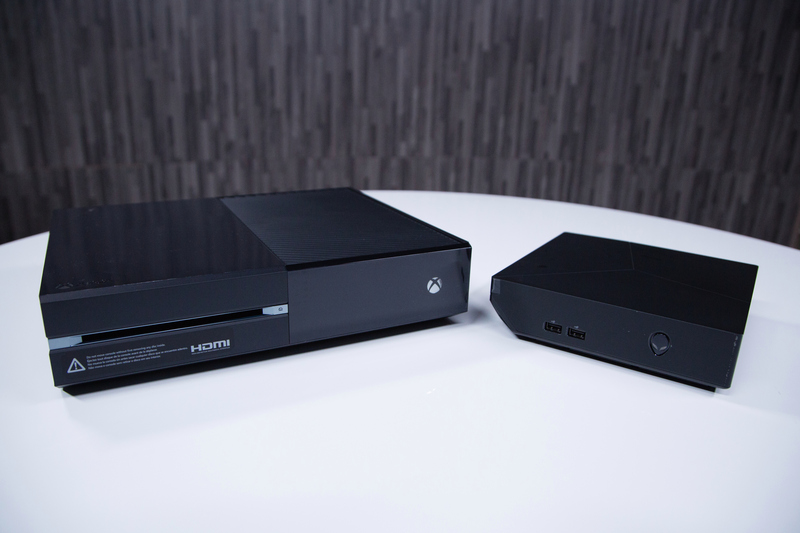 The Xbox One is the chubbiest of the three. It’s also more lightweight, with the Alienware desktop standing at 1.54 kilos, while the PS4 weighs 2.8 kilos and Microsoft’s gaming machine boxes 3.2 kilos. Impressive, to say the least, but considering that the Alpha doesn’t come with a built-in optical drive kind of takes away from the shock of its svelteness. The Alienware gaming console also solely uses an external power brick. Its main PC competitor, the Syber Vapor 1, is bigger and larger. The Alpha sports a more sophisticated design without sacrificing functionality. It undercuts its rivals not only through size and weight, but also by matching build quality and excellent chosen parts. It doesn’t creak under pressure and it has an overall sturdy feel to it. Indeed, it’s a dust-magnet, but it’s an excusable and minor flaw. 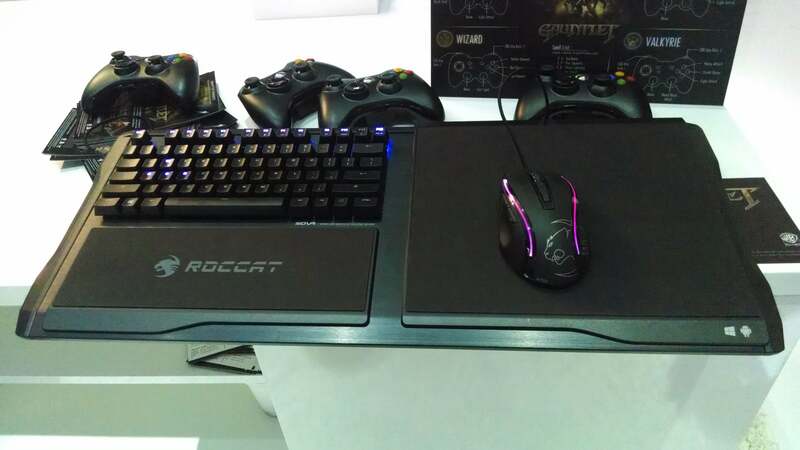 It might resemble a gaming console, but it has PC blood flowing through its veins. Its interior is fully accessible if you remove four screws and pop off the base panel – afterwards, its sides and plastic lid can be hoisted up to reveal components. Most of the Alienware Alpha’s components can be changed. The entry-level model, depending from where you acquire it, can come with a memory slot free. Unfortunately, a deal breaker to some, the GPU is soldered to the motherboard and can’t be changed at all. It comes with a wireless dual-band 802.11ac card that connects to a mini-PCI Express plug. It’s a pretty great start, and connectivity is consistent. At least for the next 4 years or so, the Gigabit Ethernet and the Bluetooth 4.0. will more than suffice. It displays two USB 3.0 ports on the rear of the machine, along with HDMI plugs – input and output. Also, an S/PDIF connector. The specially designed custom UI is aimed to work with the Xbox 360 controller – at the moment of writing this article, the Alienware Alpha game console only works with the Xbox 360 controller. Browsing the software, you’ll notice that it resembles a naked Windows 8.1 – only the bare necessities found. It has a Settings Menu which users can go to for all their networking, video and audio tools, and to change the system’s LEDs colours. In the Power Menu, you can shut down or reboot your Alienware machine and even find a link to open the default Windows desktop. Steam Big Picture divides the desktop app into three main menus – profile page, library and store. While it is indeed easy to navigate and access games, it’s not a perfect UI. This is mostly due to the fact that Alienware’s UI is obviously different – it has different fonts, colours, and navigation patterns. This displays a clear divide between Valve’s software and the machine’s UI. Software isn’t really that quick, and users have been experiencing problems with some drivers – worth noting is that you can download updates via Nvidia’s GeForce Experience app, which is a bummer. Regardless of what model you choose, you can play the majority of games at low to medium settings with a decent 30 or so fps stability. Sure, if you opt for a better model, you can increase graphics settings, but it will cost you more. I didn’t found any issues with lag while browsing the UI, and it all works smooth as butter. However, I seriously recommend not going with the 5,400rpm HDD – it will offer a sluggish experience and it will slow loading times, obviously. $499.99 – Intel Core i3 proc, 4 gigs of RAM, NVIDIA GeForce GTX GPU 2GB GDDR5, 500 gigs of storage space. $599.99 – Intel Core i3 proc, 8 gigs of RAM, NVIDIA GeForce GPU 2GB GDDR5, 1 TB of storage space. $699.99 – Intel Core i5, 8 gigs of RAM, NVIDIA GeForce GTX GPU 2GB GDDR5, 1 TB of storage space. $799.99 – Intel Core i7, 8 gigs of RAM, NVIDIA GeForce GPU 2GB GDDR5, 1 TB of storage space. Every model comes with 6 free games and Windows 8.1. – free upgrade to Windows 10. But, you should take a better look at the retailer’s website in order to build your own machine – add a pin-sharp monitor, gaming gear such as a professional keyboard and mouse, select your HDD and warranty and more. Moving on, the Alienware Alpha proved to be a silent beast – noise isn’t an issue at all. You’ll hear a slight humming sort-of sound on occasion, but that’s only when you stretch its capabilities in AAA games. It doesn’t get to molten lava levels, and CPU/GPU temps usually stand between 71 and 79 degrees even when pushed over its limits. Power consumption is lower than the Xbox One and PS4 – 10W, respectively 25W less. It requires just 22W, but it can hit 101W when under scrutiny. It’s a serious competitor to the traditional Xbox and PlayStation consoles, but it costs way more than its rivals. If you want a fast and reliable machine, you’ll have to cough up almost double the money you would pay for a PS4/Xbox One. To be frank, it’s one of the best living-room gaming systems I had the pleasure of playing on. If you’ve got the money, definitely buy it.